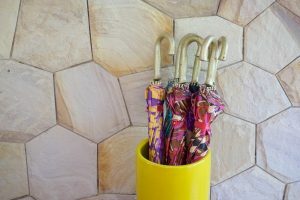 Outdoor Pool Umbrellas: Trusty Umbrellas for Pool Time! Just thinking about laying around the pool is relaxing, don’t you think? Whether you’re reading a book, have a cool drink or doing absolutely nothing, pool umbrellas help protect us against the sun’s rays from dawn to dusk. Are you looking for an umbrella that will be perfect for your home pool? Do you have a resort that needs some fresh new pool umbrellas? 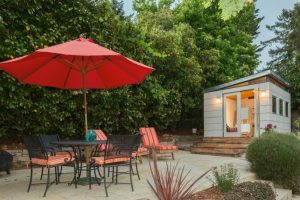 Or do you just want an umbrella on your patio? At The London Umbrella Seller we’ve been designing and testing umbrellas for many years; we know what makes a superb, high quality umbrella. We’ve chosen and reviewed five umbrellas designed for pools from the thousands available, this article is bound to make your choice so much easier. 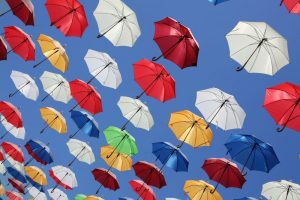 Below, we discuss the features as well as the pros and cons of each umbrella for you to easily find what suits your needs (and wants!) perfectly. We’re starting out strong with an umbrella design that is so popular right now, a four sided canopy separate from the base. It’s available in colors sand, cocoa, dark red, beige, and tan. The canopy of this umbrella is made of polyester fabric which has a high sun-resistance feature, providing you 98% UV protection. It has an 8×10 foot diameter and so covers a lot of space! 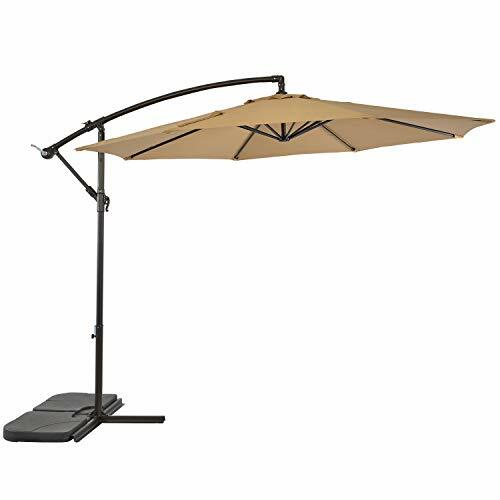 Such a size also makes it perfect for lounge chairs as well as chairs and tables, you can fit around six to eight chairs under this umbrella. Its pole and ribs are made of steel that is coated with bronze powder, which provides a reassuring protection from rust or corrosion. 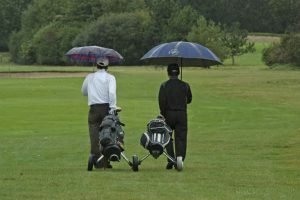 Additionally, this umbrella can be easily opened with the use of the crank lifting system which is very handy if you don’t have the arm muscles of an athlete! There is also a vertical tilt function that can be adjusted into five different positions. Moving on, we have another umbrella that resembles the shape of the previous umbrella we reviewed. The difference is that the extending rod of this model has more of a curve to it. Also, this umbrella comes in a choice of two colors, namely beige and red. This model has a canopy that is made of 100% polyester which is resistant to fading, repels water, and has UV protection. 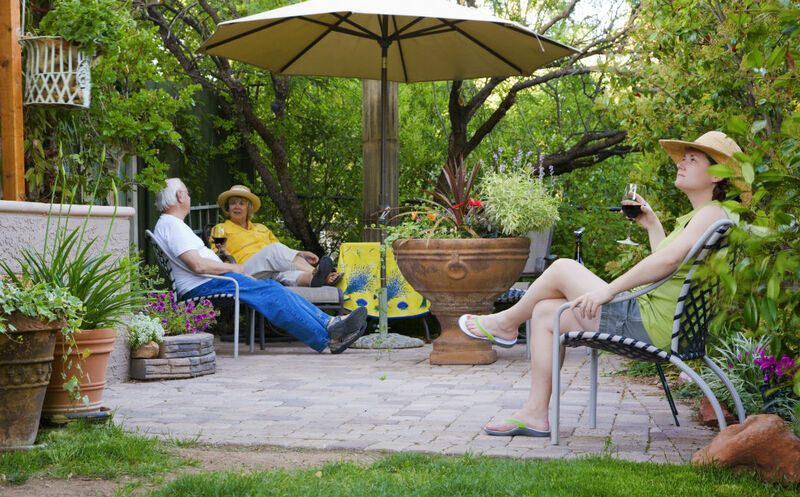 More than that, it’s also wind resistant due to its heavy duty frame that encompasses iron. There are also vents to provide proper air flow when there are strong winds; these vents help to regulate pressure and thus provide stability. 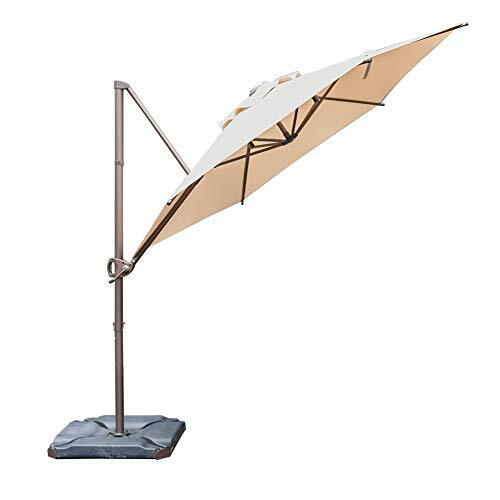 Additionally, this umbrella is easy to open and close as it has a hanging design and a cantilever operation. Further, it’s easy to store, and you can make use of its Velcro strap to firmly secure the canopy when in the closed position. 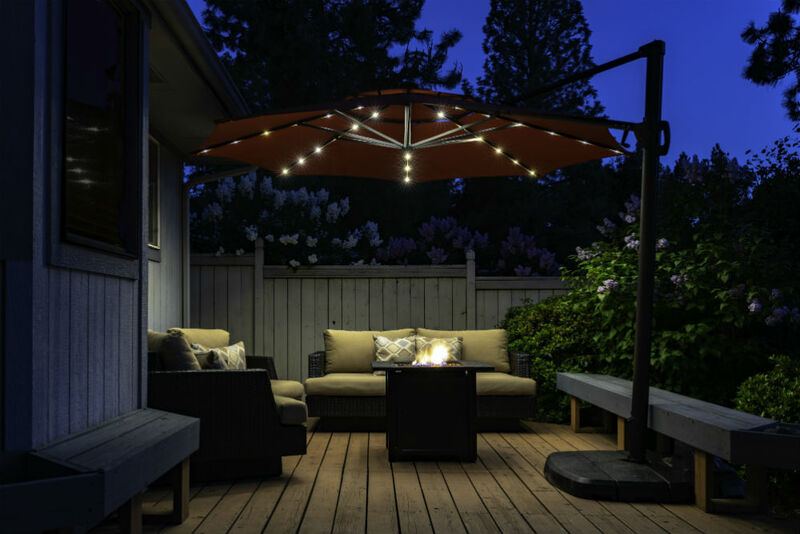 The third umbrella in our “best pool umbrellas” list is called a “sunbrella.” It’s called a sunbrella as when you use it at night, it can also act as a light source – clever! That’s what is so different with this umbrella from the others in this list. The canopy colors for this umbrella are beige, burgundy, tan, beige newstyle, and beige update. It has three LED lights along each rib, thus making 24 solar-powered LEDs in total. 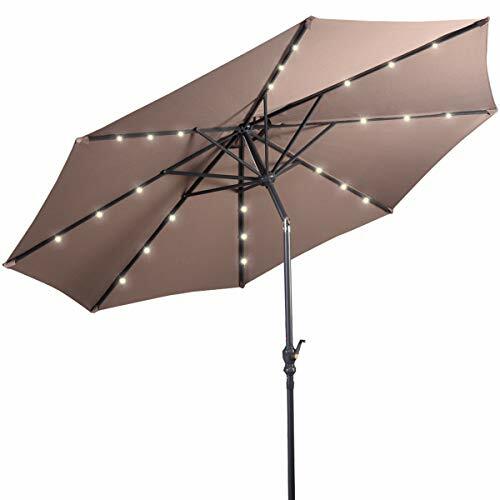 This umbrella has an easy tilt mechanism that makes it easy to adjust the angle, and the canopy is made of breathable fabric that offers UV protection while being resistant to water, mold, and mildew. 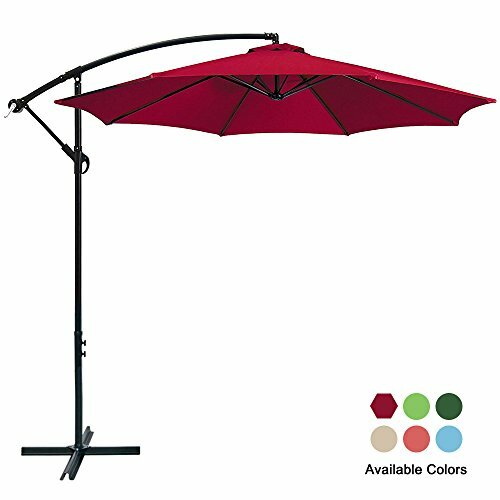 As another cantilever umbrella, this umbrella has the modern four-sided design, prefect for protecting a square of rectangular table with chairs alongside. 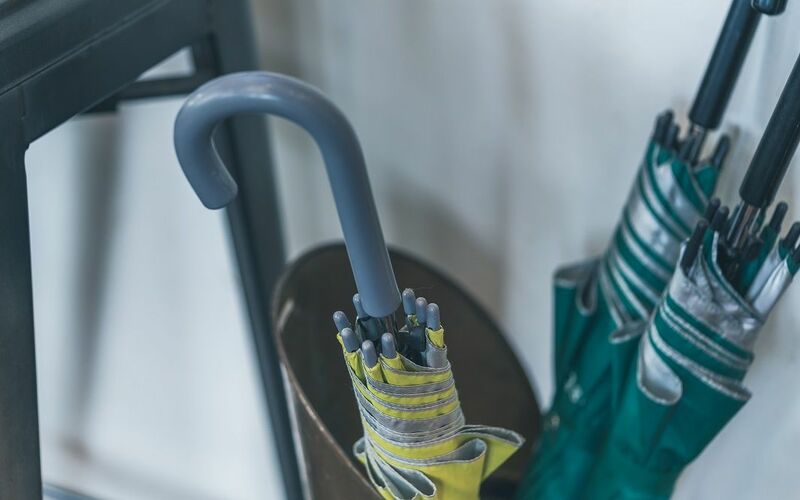 This umbrella comes in three colors – grey, brown, and beige, and it’s made of polyester material. As such, it is waterproof, resistant to mildew and fading, and most importantly, it offers good protection against the sun’s harmful UV rays. This umbrella has a crank mechanism, which makes adjusting the canopy angle so much easier. Also, with the help of the glide handle, the height of the umbrella can be adjusted into five different levels. There’s also a wind vent for proper air flow during windy days, this also gives added stability as it regulate gusts. Lastly, this umbrella can be rotated around 360 degrees so that you can turn it in any direction without adjusting the base. 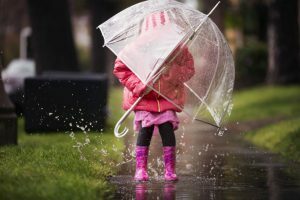 This umbrella might look like the other cantilever umbrellas in this article, however this one is the portable version of the three. It’s available in a range of fun colors, such as apple green, burgundy, and red. 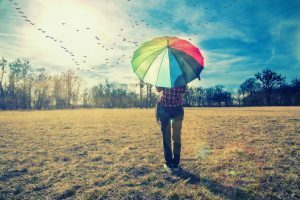 The umbrella’s canopy is made of polyester which can block 99% of the harmful UV rays from the sun. Both its pole and ribs are made of steel which has a powder coating in order to prevent corrosion and rust. 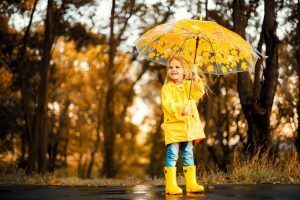 It is also resistant to mildew, mold, and fading which is great for helping the umbrella look great for years into the future. 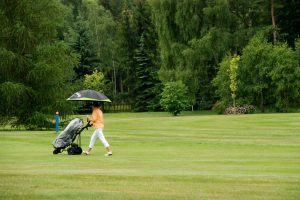 This umbrella can be operated easily with its open lift system, and there are also wind vents to assist with air flow and to increase stability as wind gusts are regulated and dispersed much more easily. Additionally, it can be rotated around 360-degrees meaning you can adjust the canopy very precisely to block the sun from dawn to dusk each day. After carefully choosing and evaluating five pool umbrellas, they all have a place around pools across the country. 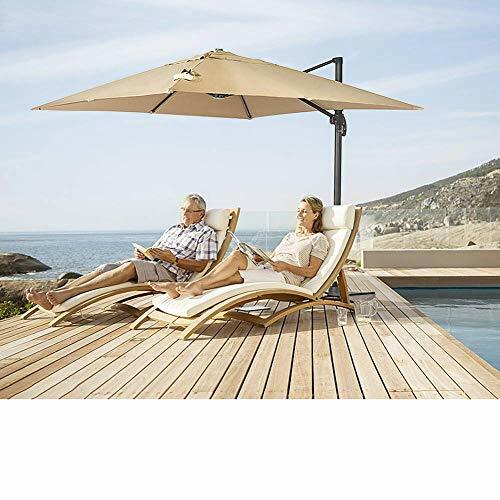 If we were to choose one out of the five, we highly recommend the Abba Patio Offset Cantilever Umbrella. We picked this one as it is very durable, provides a large area of shade, and quite simply looks a great pool umbrella!